You Check out my Best of 2016 Albums list by clicking HERE. "Cardinal," the excellent album from the New Jersey band Pinegrove, might not have made my Top 45 Albums of 2016 list, but it was still a very good album. Now, as reported by Pitchfork, if you purchase Cardinal or any other Pinegrove album from their Bandcamp page they will donate whatever proceeds you choose to pay to Planned Parenthood (for obvious reasons given the coming storm). Yes, you can pay whatever you want for any Pinegrove album, and the proceeds all go to Planned Parenthood (so give generously). Here is a link to Pinegrove's Bandcamp. Serious KUDOS to Pinegrove, GOOD ON YOU! We all need to fight back in whatever way we can - locally, regionally, or nationally. 7 Minutes of Awesome Hard-Core Goodness with UK Punks "True Vision"
You may not have much time to listen to new music, don't worry, you can listen to this EP by the Leeds UK band "True Vision" in approximately 7 minutes (takes me back). If you like it, and can still dig cassette tapes, here is a different link to their demo. True Vision is on Painkiller Records. I mostly liked this article by Paste contributor Zach Blumenfeld except that he said that Season 20 didn't produce 10 funny moments? * Butter's protest at the girl's volleyball game might have been the single funniest thing that I have ever seen on SP ever. The make kids walking down the halls "protesting" was about as close as Matt and Trey have ever come to purposely exposing Privilege. * Garrison showing back up in SP to humiliate everyone who slighted him was better parody than anything SNL did (in particular his confrontation with PC Principal). * Presenting leaving social media as akin to death almost without irony was both deep and funny. * The unexpected use of one of Skankhunts new Troll buddies to constantly call Skankhunt (Mr. Brafslafsky) out on how reactions against political correctness can themselves go way too far was funny and unexpected coming from two writer's who are usually pretty Libertarian (IMHO). * Cartman's Mars fantasies were pretty funny IMHO as was when he finally realized his girlfriend was so smart that it was going to expose him for who he really was. That is actually more than ten (some bullet points had multiple examples). 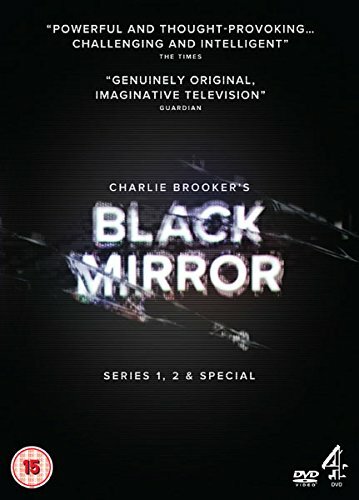 The thing that struck me the most was that South Park, Black Mirror, and Westworld all covered a lot of the same territory in 2016 (through very different lenses). If you didn't see SP Season 20, I would highly recommend it (especially as a funnier counterpoint to the overwhelming dread created throughout S3 of Black Mirror). Okay, that is the end of another news day. Hope you are enjoying the new news feature. I am going to go get back to work learning more about podcasting so that I can start the pod ASAP. I have a feature coming soon on the outstanding new Cherry Red Records 4 Disc Punk Boxset "Action Time Vision." Help Pinegrove support Planned Parenthood! What did you think of True Vision?